Lawrence Berkeley National Lab (LBNL) scientists, led by Max Sherman and Iain Walker, are investigating whole-house ventilation options to support California’s Zero Net Energy Homes initiative. 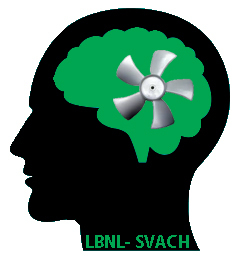 This research project is called Smart Ventilation for Advanced California Homes (SVACH). 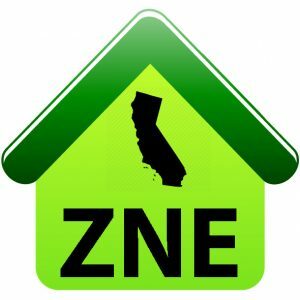 California’s energy-and-climate goal calls for all new residential buildings in California to be zero net energy (ZNE) by 2020. 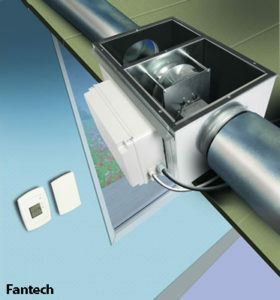 To meet ZNE requirements, the building industry must reduce energy consumption from air leakage by at least a factor of two – from roughly 4 ACH50 in current production homes to 2 ACH50 or less. This air-leakage reduction represents about 15% energy savings and 15% electric peak load reduction. Previous LBNL research estimated about 1,000 kilowatt-hours/year energy savings in a typical California ZNE home. These savings come through the HVAC system’s heating and cooling of air leakage and excess ventilation airflow. Smarter controls minimize ventilation airflow to what’s necessary for acceptable IAQ. Better insulation and windows can reduce heat loss and gain to a very low level. Increasingly airtight building envelopes dictate that the energy needed to ventilate and to condition ventilation air will represent a increasing fraction of future home energy use. Nevertheless ventilation is essential for occupant health and building durability. California and the world need new ventilation technologies to achieve healthy and durable ZNE buildings. Concern about adverse impacts of air-tight buildings on IAQ is a major barrier to to the ZNE goal. The concern is that reducing tighter homes will cause health problems and reduce building durability. The SVACH results will lower this barrier by providing both the quantitative and qualitative information needed to demonstrate how to achieve acceptable IAQ while reducing natural infiltration. California homes must achieve and maintain good IAQ, or California utility ratepayers will bear considerable additional healthcare costs. IAQ studies generally show that health-related IAQ costs are greater than energy related costs of ventilation. But it’s difficult to make an exact comparison. LBNL scientists and their partners at the California Energy Commission, the US DOE and the private sector hope to combine SVACH research with new control products. With these advancements, Smart Ventilation can deliver the following benefits to California and beyond.